The year is a third over and we're entering spring. I'm seeing more asparagus in the market now, including white asparagus, which I've never cooked but would like to try. Also, I'm excited that peas of all forms will soon be in season and I'm looking forward to making (and sharing with you) my favorite spring pasta recipe that uses a risotto-like technique to make a creamy sauce without any added cream. 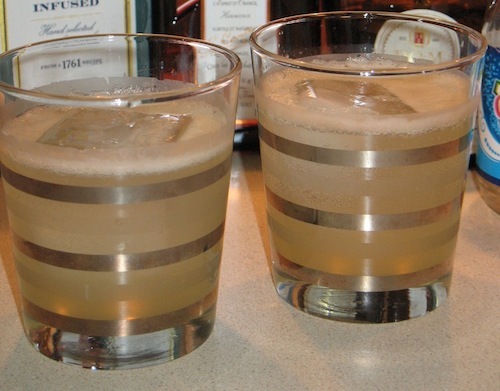 The most popular recipe for March was a cocktail: The Whore's Bath inspired by the television sitcom Happy Endings. It's a tart-sweet concoction with an herbal undertone featuring gin, Benedictine liqueur, Cointreau and grapefruit juice topped with club soda. The recipe is far and away the most popular thing I've done so far on Cook In / Dine Out; it's been accessed about 6 times more than Kale "Caesar" Salad, the next most popular recipe. March's most popular food recipe was the Crispy Pizza, my attempt to make pizza with a crispy, charred pizzeria-like crust. The Turkey and Butternut Squash Meatloaf was also pretty popular, as was the Updated Chicken Marbella, although that doesn't really count as a recipe, since I wrote about making it and didn't include instructions (there is a link to the America's Test Kitchen subscription site). I could use a Whore's Bath right now. The cocktail you just served me is a little flat.